The assault is an attempt to recapture areas seized by the rebels last week. Our correspondent in Mogadishu says the sound of heavy gunfire and shelling can be heard across the city. Forces loyal to the transitional government in Somalia lost control of about one-third of the capital to militants last week. Ten days of fierce clashes between the pro-government forces and militant Islamic groups – al-Shabab and Hisbul-Islam – have left more than 100 people dead and displaced 34,000 civilians. 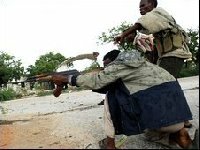 In Friday\’s offensive, at least seven people, one of them a local journalist from Radio Shabelle, were killed. The BBC\’s Mohamed Olad Hassan, in Mogadishu, says the pro-government forces have launched a massive military offensive against the insurgents. Most of the fighting is focusing around one of the city\’s main roads, Wadnaha, he says. African Union peacekeepers based in the capital to support the fragile administration are not involved in the attack, he adds. The 4,300-strong force does not have a mandate to pursue the insurgents. \”This is a large military offensive against violent people,\” military spokesman Farhan Mahdi Mohamed told AFP news agency. A moderate Islamist President, Sheikh Sharif Sheikh Ahmed, was elected by a unity government in January as part of a UN-backed peace initiative. But even his introduction of Sharia law to the strongly Muslim country has not appeased the hardline guerrillas, who are accused of links to al-Qaeda. The Horn of Africa state has been mired in conflict for 18 years.